This weekend I saw the stunning, chilling anti-war protest/memorial known as Arlington West in Santa Barbara, California. 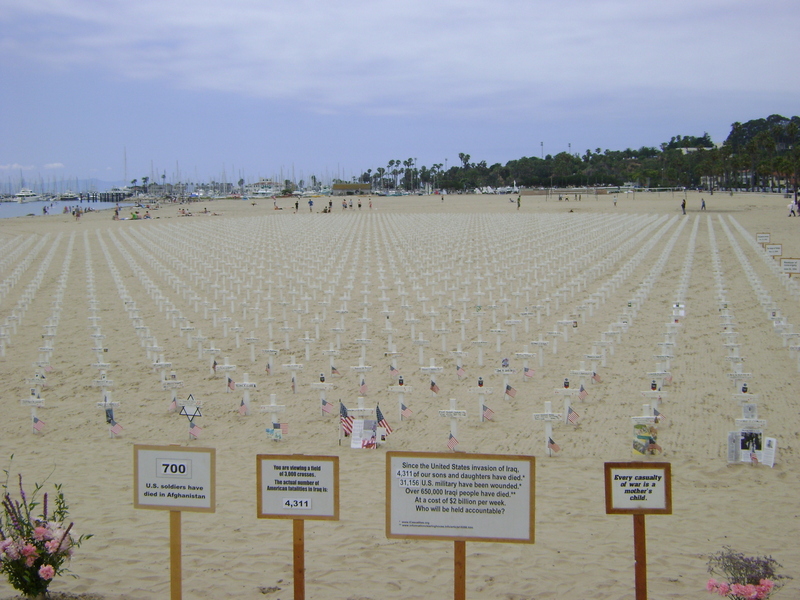 Since November 2003, community activists, mainly from Veterans for Peace, from the Santa Barbara area have weekly transformed the beach adjacent to Stearns Wharf, a heavily trafficked tourist site, into a Central Coast version of a beached Arlington National Cemetery. The display of 3,000 little white crosses (and a handful of Stars of David and Crescents) represent fallen soldiers in Iraq. By the 3,001st death, the group stopped adding new crosses. Seeing this kind of visual representation of the cost of the war in Iraq was incredible, but the power of the exhibit comes from the complete transformation of a prototypical Californian tourist landscape — a sun-soaked, palm-lined, sandy beach — into a staggering war memorial. Moreover, the merger of a historical eastern landscape into this western coastal landscape further illustrates the group’s effort to visually deliver the impact of the war to a distant audience on the edge of the country.